Zoo Monday 29 June - The other end. A group of us had a session this morning at the other end of the Zoo from our usual net sites. We caught 59 birds of 5 species with 37 new and 22 recaps. Among the recaps were a couple of interesting birds. Blackbird -1 (1) The recap proved to be the highlight of the day. It was banded as a nestling on 29 Dec 2005 and is at 3469 days the 3rd oldest Blackbird. The 2 older birds are both dead so this bird still has the chance of taking the record. Silvereye - 26 (21) Two of the recaps were over 5 years, one was banded in April 2010 with its only other recapture a month after banding. The other was banded May 2007, and this bird has been recaptured regularly with the last time 9 days ago. Henk banding one of the Tui. I arrived home to receive a recovery report from the Banding Office of a Tui which had been banded at the Zoo on 1 Aug 2009, so 4 birds over 5 years in one day was pretty good. I had another session with children from the Houghton Valley School this morning. There were heaps of Silvereyes, in fact too many for me to handle. Only put 2 nets up and then furled one after clearing it once. Caught 22 new Silvereyes and 18 recaptured, the only other bird was a new Dunnock. As is usual the kids really appeared to enjoy the experience of learning about the birds, the banding process and being able to hold and release one. We were also joined by the School Principal who is very enthusiastic and supportive. Dave (School caretaker and my liaison person) showing a group the mysteries of a mist net. And another lot are released. The final group together with the School Principal. I set the funnel trap here again on Wednesday morning with almost alarming success. Caught 131 Silvereyes which is the most individual Silvereyes I have ever caught here in one day since starting in 1995. The previous record was 124 caught on 21 July 2003 and the second highest was 114 on 26 June 2006. Wednesday's total included 43 new birds and 88 recaptures, most of the recaps were banded in the last couple of years, especially the last month or so. But there were some older birds, 11 banded in 2013, 5 in 2012, 7 in 2011, 1 in 2010, 1 in 2009 and 2 in 2008. It was the first time that the bird banded in 2010 has been recaptured so hopefully there are still more older birds out there. I have managed to track down the details of the Silvereye with the "Foreign" band, (see previous post). It was banded by the staff at the "Nest" (Animal Hospital) at the Zoo so had only moved a few 100 meters. The bird had been in rehab at the Nest and was banded before its release. Great to know that is still around. Despite a dire weather forecast we had near perfect conditions for our Zoo session on Saturday. Low cloud and a light southerly, from which the Zoo is protected, and rain that held off until the last net was down. We had another very good catch with 158 birds of 7 species with 109 new and 49 recaptures. Fortunately we had a very good team of banders and helpers with enthusiastic youngsters. Several new people were trying the experience for the first time as well as some very experienced banders. Some of the "Team" busy around the banding table. Dunnock - 0 (1) a bird banded in Feb 2012 so a reasonably old bird. Yellowhammer - 2 (0) our first new YH's at the Zoo for about 3 years. George with his second Yellowhammer - somehow he managed to band both. Silvereye - 65 (37) Most of the recaps were from the last couple of years especially the last 2 sessions but there were some older birds. Six from 2013, 2 from 2012, and 1 each from 2011, 2009, 2008 and 2007. The 2007 bird is at 2954 days from banding our 3rd oldest Zoo banded Silvereye, surpassed only by birds at 2976 and 3276 days. We had a Silvereye with a band which was not one of ours, I am trying to find its origin - watch for an update. George and I had a busy afternoon at the Houghton Bay School. We were ably supported by Andrea as our scribe and George's Grandparents as enthusiastic observers. We also had a lot of Silvereyes and happy children. Dave the Caretaker at the school and our main contact there brought down small groups of kids so they could see the activity and most were able to hold and release a bird. Some of the kids releasing their birds. The target species at this site is Silvereye as they are ideal birds to show children and for them to be handled (they don't bite). We caught 45 new and made 4 recaptures, 2 of the recaps were from the Houghton Bay site at the bottom of the valley. Only other birds caught were a Blackbird and a Dunnock. I set the funnel trap here this morning primarily to check on the Silvereye numbers. I was pretty successful and there appears to have been an influx of birds during the cold weather we have had over the last few days. Caught 80 with 22 new and 58 recaps. Among the new arrivals were several older birds. Thirty five had been banded this year including 3 from the Zoo and 2 from Houghton Bay. 10 were banded last year, 6 in 2013, 4 in 2011, and 1 each in 09, 08 and 07. This year, up to now, we have caught 73 new Silvereye at this site - in all of last year we only caught 71. This time last year we had only caught 6 new birds. By-catch included 1 new Blackbird, 1 new Greenfinch and a H Sparrow recap. We had a successful session at the Houghton Bay stream on Saturday. Caught 60 birds of 9 species, only 4 were recaps which is a bit disappointing. We have banded over 5500 at this site since we started there in 2008, so I think there must be a large number of birds in the area. Alan banding the Fantail closely watched by his son Sam and his son's friend Axel. I set the funnel trap at home yesterday and had a pretty good catch. Caught 43 birds with, as expected, most being Silvereyes - 22 new and 12 recaps. No old birds among the recaps with a 2012 bird being the oldest. Often older birds don't return until July. Silvereye numbers are about 3 weeks ahead of most years when we don't usually catch significant numbers until the end of June into July. One of the Silvereyes had a very orange chin. Other birds caught were 2 new Greenfinch and 4 new House Sparrows and a recap. A group of us attempted to catch birds this morning at our Island Bay site with very limited success. The team waiting for some action which didn't really arrive. Andrea (scribe) Ros, George & Sarah. For a variety of reasons we hadn't been there for several months and I had expected a reasonable catch. But we only managed 17 birds of 3 species with 15 new and 2 recaps. Almost certainly the main cause of the poor result was a very late start with the majority of birds having fed and departed. The other possible factor was that a strong northerly wind developed affecting the nets and the birds flight path. 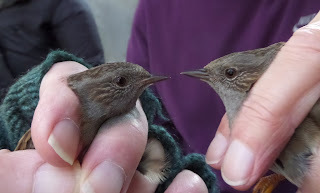 5 Dunnocks and a recap. 9 House Sparrows and 1 recap. The only real highlight of the morning was the sighting of a colour banded Tui. It had been banded on 4 June 2007 so at 2926 days from banding is a reasonably old bird. I had another attempt to catch Yellowhammers at the football field at Newtown Park this morning with a little more success. Midweek there had been over 500 feeding there but they must have consumed most of the available seed because by this morning numbers had dropped to about 100. The football field viewed from the banding site. I managed to catch 9, all new, and a bit disappointing not to have recaptured any of the 200 or so that have been banded there in the last 6 years. The only other bird caught was a Kingfisher which was a bit of a bonus. I have set the Funnel Trap a couple of times here recently with limited success. Last Wednesday I caught 18 birds; all Silvereye with 9 new and 9 recaps. I set it again yesterday and again caught 18 birds; 15 Silvereye, 10 new and 5 recaps as well as 1 new Dunnock, Greenfinch and House Sparrow. A bit like I was worried that would happen to the Blackcaps (NZ's cricket team) - both sessions were stopped by rain. Yesterday I received two recovery reports from the Banding Office. One was a Blackbird that had been banded at our Island Bay site in Jan 2014 as a juvenile and recovered dead on the other side of the valley. The other was a colour banded Tui found dead in Northland (a Wellington suburb). It had been banded at the Karori Cemetery in July 08. It was seen feeding on sugar water in Roseneath on the other side of the City in Nov & Dec 09. Subsequently it must have moved back across the city to where it was found. The owner of the property reports that it was resident there when they moved into the property back in February. Although this is not one of ours I have had an interesting report from Ralph this morning about a resighting of a colour banded Tui. This was of a bird from a study he did in Southland in the early 1990's. It had been banded 16 Dec 2004, at 3817 days from banding it is about 3 weeks longer than our oldest Tui here in Wellington which is 3797 days from banding. We have a Blackbird that was longer at 4021 days and a Silvereye that was exactly the same, 3817 days. Ralph's Tui was originally fitted with a radio transmitter which hasn't appeared to have affected it's survival at all.